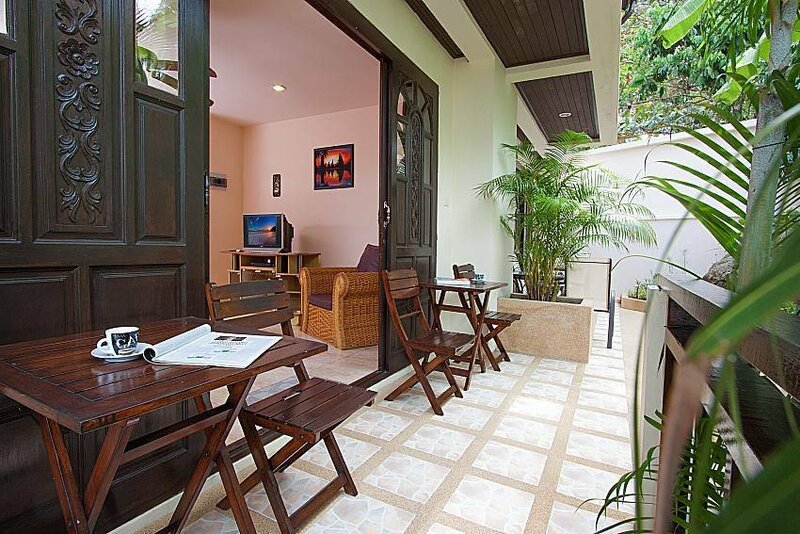 Merging modernity, privacy, convenience and affordability, this 2-bedroom townhouse style villa sits in a gated estate with a communal swimming pool, 300 meters from Chaweng Noi beach. This value for money villa rental is the ideal choice for those who want to enjoy a resort-style atmosphere just 300 meters from Chaweng Noi Beach on the eastern coast of Koh Samui. This townhouse-style home comes with 2 bedrooms and sleeps up to 4 people, located on a gated estate with 24-hour security and a communal swimming pool and Jacuzzi that is the center point of the complex. This modern villa is just a few meters from the pool, the views of which you can enjoy from your cozy terrace area. Making your way into the living space, you will encounter a shady lounge with a television that has international channels, a DVD player and a wicker sofa set. There is a quaint kitchenette area in the living space, coming with a few appliances and also a breakfast bar that can seat all four of you at the same time. This villa has 2 bedrooms that both come with wardrobes and air-conditioning. Your will find a king-size bed in the master bedroom and 2x single beds in the guest room, making this an ideal villa rental for families. And if you are a larger group, a total of 5 2-bedroom houses and 4 1-bedroom condos are available for rent. Being just 300 meters from Chaweng Noi Beach and walking distance to bars, shops and restaurants, this is one of the most convenient holiday locations in Samui. And with the main Chaweng Beach area also nearby, which is famous for its exciting nightlife and international restaurants, you really do have everything close at hand.